A kids pretend market or grocery store is a wonderful way to encourage pretend play, creativity and imagination. Your child will be learning many new skills without even realizing it! You could set out to explicitly teach your child things such as counting, letter recognition, problem solving, etc. through structured activities and worksheets. But as more and more studies are being done about the benefits of pretend play, we know that children can and will learn many important skills by playing. 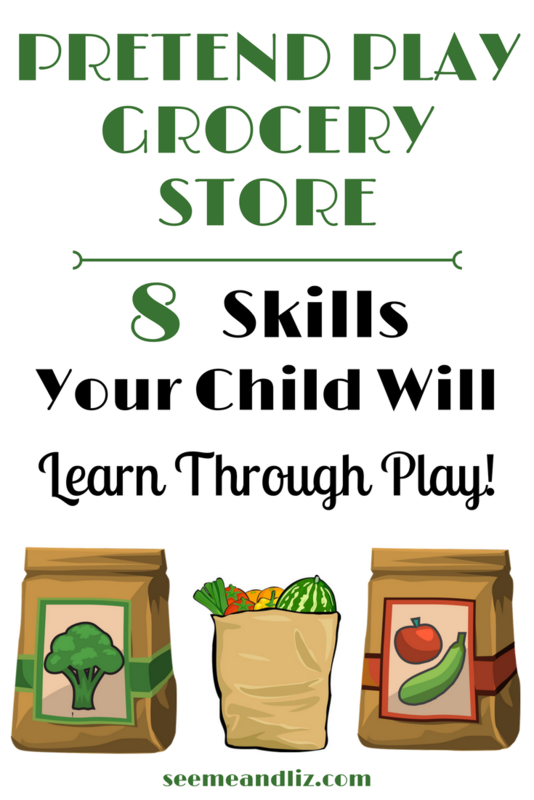 Let’s take a look at all of the skills your child will learn or improve on with a simple activity such as a pretend super market. 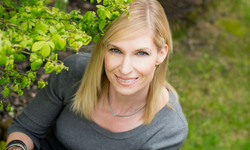 If you want to skip the skill development section, click on the link to see my recommendations for setting up a great make believe market! If your child is still learning new words, this is a great way to introduce vocabulary. 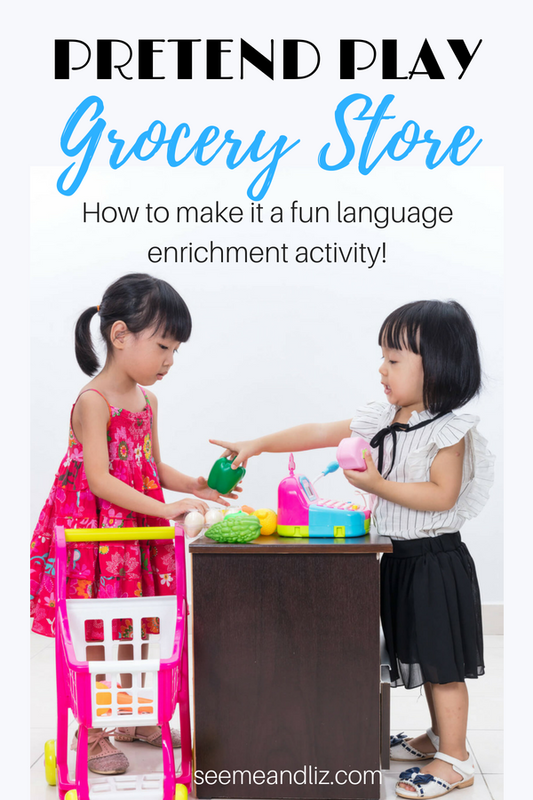 Think of some market/grocery related words that your child doesn’t know yet and label those items/actions as your child is playing. Pretend play itself helps develop and strengthen many skills including speech and language skills, reasoning and critical thinking! This is an often overlooked area in a child’s development. It is something adults do almost unknowingly, but without the ability to categorize our lives would be complete chaos. There are many items that can be categorized during a trip to the grocery store (real or pretend). Sort food according to color or type (e.g. fruits, vegetables, meats, snacks, breakfast, lunch, dinner) or by other characteristics such as foods that need refrigeration vs. those that do not or fresh food vs. processed food. Count how many items are going into the grocery cart/bag. Make price tags for items (great for older children). Use pretend money (that you have made or purchased) to buy certain items. With older children see if they can figure out how much money they need to make their purchase and how much money they should be getting back. If children are playing together they will need to take turns in each role. They can also practice what it would be like to be a grocery clerk or shopper. Children/parents can practice giving and following directions. For example, ask your child to make sure to add _____ and _____ to his grocery list. You can come up with any directions you like. 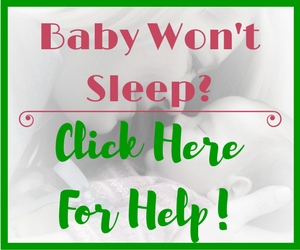 Perhaps your child is looking to buy a specific product but your market does not seem to carry that. Is there another item that would work instead? Maybe she could come up with a way to include that product in her market (e.g. draw a picture of it, if you don’t have the item in your toy supplies). Or what happens if there isn’t enough money to pay for everything? Your child can practice picking up coins and sorting through bills. Use an old can with a small slot cut into the top so your child can practice picking up a coin and dropping it into the slot! 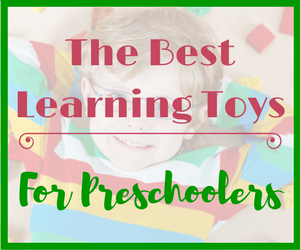 There are so many skills that can be practiced or acquired with this pretend play activity. Don’t feel that you need to script the activity though. If you and your child are playing together try to get down on his level and follow his lead. If multiple children are playing together, sit back and watch them interact. There are many options when it comes to these types of scenarios. Your child will learn some of the aforementioned skills all on his own, while others will require your involvement. Remember, children need time for unstructured play as well as a bit of adult guided play here and there. You can either use a shelf you already have, build one out of wood or cardboard boxes or purchase a ready made one such as the Melissa & Doug Wooden Grocery Store and Lemonade Stand. I love this one for many reasons! It’s a 2 in 1 product which makes it even more versatile. The picture shows the lemonade stand, but if you flip the awning over it says “Grocery Store” on the other side. Click on the image to see both variations. With some creative thinking this stand can have many more uses such as a puppet theater, a ticket booth, a fort, etc. There are so many food items to choose from. Scroll down to see the 2 sets I recommend to get started! If you already have a kids pretend play kitchen, you may already have a lot of play food. This set comes with all items seen in the picture, including the apron, basket, signs, money, food and grocery list writing pad! There are 93 pieces in total (this includes the play money). This set comes with all the items pictured below, including the 4 wooden crates to store the food in! It is also great for the categorization activities I mentioned earlier. There are so many kids grocery carts to choose from. I have chosen the Precious Toys Kids & Toddler Pretend Play Shopping Cart because it’s collapsible and it comes with some play food and pantry items! However, it only comes in one color – pink. But please don’t let this discourage you from buying it for your son. I have always told my children that colors are just colors. It doesn’t matter if you are a boy or girl, you can like whatever color you want! 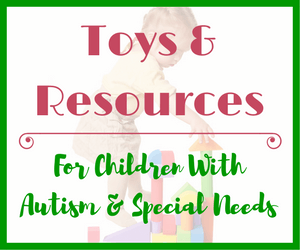 Boys and girls should have access to the same toys! One thing I want to point out is that the reviews for this shopping cart are quite mixed. The negative reviews mention it being flimsy, made of very thin metal. If you have more than one child or want something that will last many years, take a look at the Melissa & Doug Grocery Cart! Unfortunately it does not come with any play food and comes with a higher price. But you are paying for a quality and durable toy that will last! The Boley Kids Toy Cash Register completes your child’s pretend market or grocery store experience. This cash register has a working calculator and comes with a bit of play money and a small basket with a few grocery items (not shown in picture). The scanner lights up and the conveyor belt moves! Another kids cash register I always recommend is the Learning Resources Pretend & Play Calculator Cash Register. It does not come with any play food but it does include a 73 piece set containing 30 pretend play US bills, 40 pretend play coins, a “credit card” and an activity booklet. 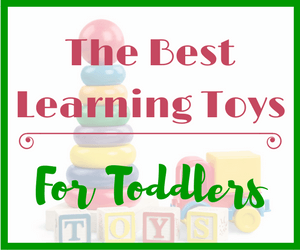 Let’s Start Shopping & Learning Through Play! You definitely do not need to purchase every item on this list to have a fully functioning kids pretend market. I am not very good at DIY projects, so I tend to take the easy way out and buy these things. But you could certainly build your own food stand, use a calculator as a cash register (maybe mount it to a small cardboard box and cut a hole in the bottom for the money) and find a few reusable shopping bags instead of a basket or grocery cart! Like I always tell my kids, just use your imagination – I’m sure you will come up with something great! If your kids are old enough, involve them in the brainstorming! This is a perfect idea for a gift for my granddaughter. She is coming to visit me next month so I can buy this to her. I am sure she will love it. I like that she can also learn new things and also she can practice some math. Happy to hear you like my suggestions for a kids pretend market. I am sure your granddaughter will love both the reversible stand and a cash register! It’s a great way for kids to play and learn at the same time. Oh this is such a fun idea! And the kids will learn so much at the same time. I love the wooden baskets of food, those are great. My little one just got a cash register for Christmas and she’s been absolutely loving that thing. She is still learning to count so might be a bit far off doing math but its still a great vocabulary and motor skills exercise for sure! Let your daughter enjoy playing with her cash register for now. If she is just learning to count then it is definitely far to early to try teaching her math concepts. As you said, she will still gain vocabulary as well as fine motor skills while playing naturally! This is pretty great! My little sister is six years old and she loveeees to pretend she’s shopping, or cooking. I bet she would love something like this for her birthday!The grocery buggy is precious. She would probably want that the most. The fake money would probably help out her math skills too. All of the items I mentioned would be great for a 6 year old! It’s the perfect age for really getting into pretend play! I’ve got a lot of ideas on your blog Tanya. Thanks to you. I am happy to hear that you are finding my articles helpful! This is great to read and full of ideas! My 3 year old loves to play supermarket! She especially loves the little beeps and noises from the cash register. I would really like to try and start teaching her Spanish. What would be the best way to go about this? I am happy to hear that Melissa! 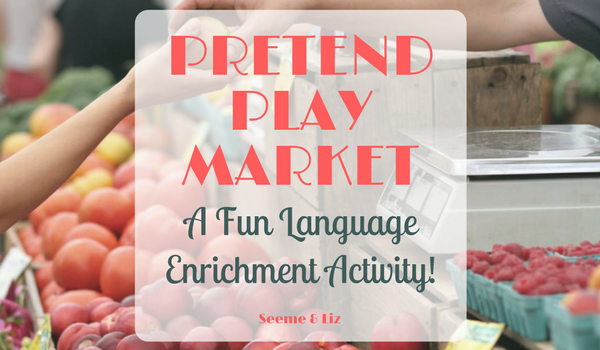 A kids pretend market is so much fun that kids don’t realize the skills they are learning! Do you speak Spanish fluently? If so, I would just start speaking to your daughter in spanish. You could start by labeling common items and toys but then start speaking in grammatically correct sentences. In order for her to become proficient in Spanish she will need to be quite immersed in the the language. 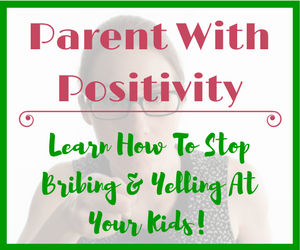 Hello there, this is a great article, my youngest son is 3 and unfortunately his speech is a little slow when compared to other children his age. Your tips throughout are fantastic and I particularly like the vocabulary, social and maths counting tips. He likes joining me at food shopping so your suggested products look like a great idea for his upcoming birthday – many thanks, much appreciated. Thanks for your comment and that you found value in the tips I have shared. If you are concerned with your son’s speech and language development, make sure to contact a registered Speech-Language Pathologist to set up an evaluation. Also, here is a quick list of milestones that should be reached at certain ages. Hello and thanks for putting this page together. What a great idea! My 6-year-old loves to play pretend everything and setting up a grocery store in the den is something I know sheâ€™ll love. We do a similar restaurant-type activity under the big slide at the playground. Have you used the lemonade stand? It looks super fun and would add a layer of authenticity to the experience. Was wondering how bulky it is and if itâ€™s easy to use and store. Playing grocery store is so much fun for kids! I don’t think you are alone in not realizing the skills that children build during pretend play. Many parents are not aware of this. That’s one of the reasons I started this website. To show parents that you don’t need fancy apps and electronic toys for kids to learn. In fact, studies show that kids learn a lot more from traditional play than they do from being thrown into learning academic skills to early. I have not personally used this lemonade stand. But from what I gather, the total height is about 4 ft (2 ft from floor to top of counter, and another 2 ft from top of counter to top of the canopy and it is a little more than 2 1/2 ft wide. Hopefully that will give you a better idea of how much room it will take up. Unless you have a large storage room, you would need to take it apart to store it. Hope that helps! If you do decide to get this for your daughter, please come back and let us know what you think of it. 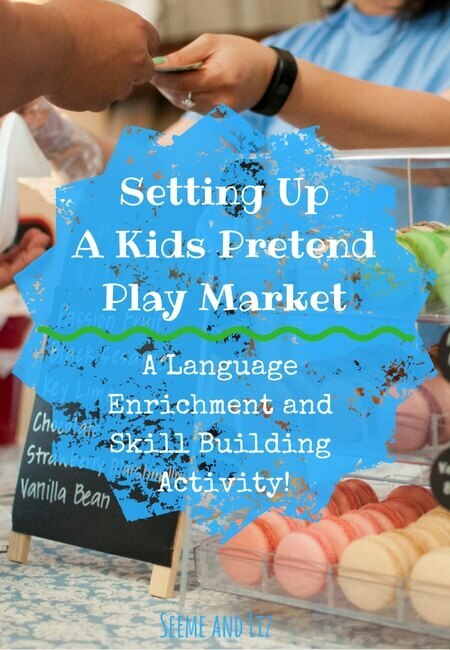 A pretend play market is a wonderful idea. My children will really love this. They already like math and numbers I can not wait to introduce this to them. There are a lot of kitchen food toys out there so this can be a growing and ongoing store we build together. Thank you so much for the idea. Thanks Keith! My kids love playing “grocery store”. Pretend restaurant is another favorite of theirs as well. And many of these toys can be used together for a variety of different scenarios. Glad you liked the idea!